--A climber is recovering from his injuries after the Chelan County Sheriff's Office and the Snohomish County Air Support Unit rescued him Saturday afternoon. The Chelan County Sheriff's office said David Kieninger, 39, from Wenatcheee, fell about 500 feet during a climb on Seven Fingered Jack Mountan. Another climber called 911, saying Kieninger suffered a head and hip injury, possible broken arm, and other injuries during the fall. To read more, click here. --Detectives with the King County Sheriff’s Office Major Crimes Unit would like the public's help to identify skeletal remains found on Mt Si, near North Bend Washington. Evidence suggests the remains may be from the mid 90’s. On 06/16/15, two off trail hikers came across what they believed to be human, skeletal remains near the “haystack” on Mt Si. After they called 911, deputies responded to the scene, collected the remains, and took them to the King County Medical Examiners office. To read more, click here. --While final skier and snowboarder visits to Canadian ski areas have not yet been released, resorts in Western Canada had a poor to average season. The winter's warm temperatures, below average snow, and decreased days of operation have led a few ski areas to offer dramatically reduced rates on 2015-16 season passes. To read more, click here. --On Earth Day in April, regional grocery chain Haggen said it would donate 2 percent of its sales in its Washington and Oregon stores to national parks in those states. Last week, the chain announced it was donating $33,690 to Washington’s National Park Fund, the official nonprofit partner supporting Mount Rainier, North Cascades, and Olympic national parks. To read more, click here. --The New York Times posted a very well researched article on the deaths of Graham Hunt and Dean Potter in Base Jumping accident in in Yosemite in May. To read the article, click here. --The BLM is proposing improvements for the Red Rock Canyon Scenic Drive and the trailheads. The agency is also proposing a shortcut, which would allow visitors to duck-out early, and not have to stay on the one-way road for all of its 13 miles. To read more, click here. --New Mexico’s 11 ski areas saw a 19.4 percent increase in skier and snowboarder visits in 2014-15 compared to 2013-14, to 909,357, contributing to a $98 million increase in local economic activity, according to Ski New Mexico. To read more, click here. --A busy weekend continues for emergency responders at Zion National Park. Despite recent hazardous weather alerts warning of dangerously high temperatures, Zion has been packed with visitors who are hiking, biking and otherwise recreating within the park under a hot summer sun. Physical exertion in the stifling temperatures has already led to many heat-related emergency calls in Zion. To read more, click here. --A climber is in critical condition after falling off the First Flatiron in Chautauqua Park in Boulder. The climber fell around 6 p.m. on Tuesday. To read more, click here. --Rescuers at Rocky Mountain National Park performed two separate, complex evacuations through snow, rocks and thunderstorms on Sunday. To read more, click here. --So some guys in Colorado made a first ascent using a drone to put the rope up. To read about it, click here. --AAI Team 7 climbed to the summit of Denali on Monday! They were the last AAI team on the mountain. To read about all the trips, click here. --Former AAI Guide Chantel Astorga and Jewell Lund made the first all female ascent of the Denali Diamond (Alaska Grade 6, 5.9 A3/M6 A1 WI5+, 7,800') on Denali. This was not only the first female ascent of the route, but likely the first all female ascent of an Alaska Grade 6. To read more, click here. --A dispute over the height of North America’s tallest mountain may be resolved this week, as surveyors climb to the top of Mount McKinley. McKinley – recognized throughout Alaska by its Koyukon Athabascan name, Denali – has long been thought to stand at 20,320 feet, a measurement recorded in 1953. That number was contested in 2013, when the United States Geological Survey (USGS) used radar technology to re-calculate the mountain’s height. The result was a mere 20,237 feet… 83 feet lower than the previously recognized elevation. To read more, click here. --British Alpinists Mike "Twid" Turner and Tim Blakemore made a first ascent of a new route on the rarely climbed North Triple Peak (8399'). To read more, click here. --An experienced mountaineer from Kalispell was injured June 27 in a massive fall in Glacier National Park that required a complicated helicopter rescue in steep, rugged and remote terrain. Jack Beard, 60, is hospitalized but in stable condition after falling some 600 feet while attempting to pioneer a new route up a glacial wall called the Lithoid Cusp. To read more, click here. 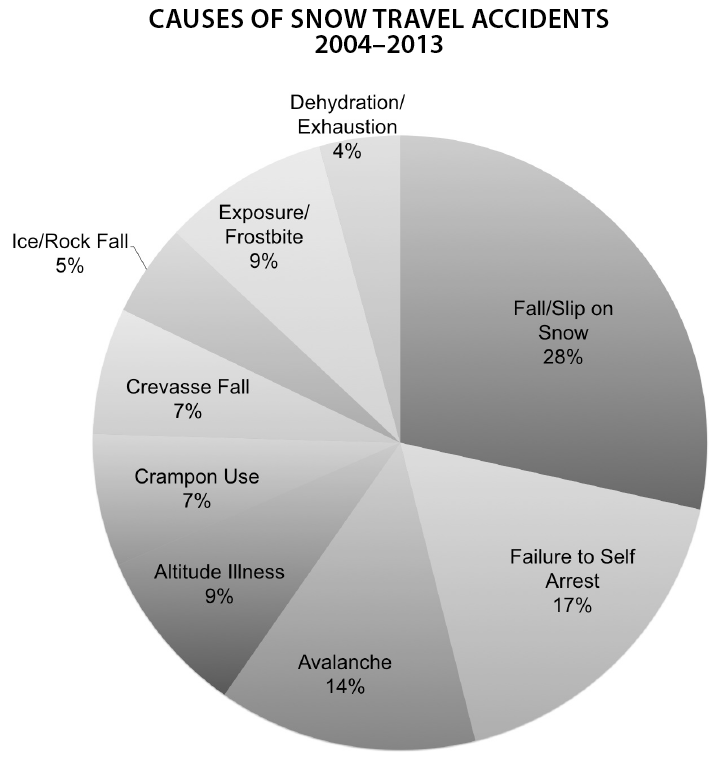 --AAI Operations Manager Jason Martin, and Director, Dunham Gooding, co-authored an article for last year's Accidents in North American Mountaineering on snow travel. To read the article, click here. Last week, REI purchased Adventure Projects, a website that compiles trail data for climbers, mountain bikers, skiers, hikers and trail runners, for an undisclosed sum. Adventure Projects is a Boulder-based business founded in 2005 by Nick Wilder and Andy Laakmann. Laakmann is also the developer and owner of the very popular climbing gym POS software, Rock Gym Pro. Terms of the deal were not disclosed. Megan Behrbaum, manager of New Ventures at REI headquarters in Seattle in told Times Called Business, “Mountain Project is a hub for the climbing community to talk about and discover the best spots to climb around the world. It is the definitive resource for more than 3 million climbers, featuring more than 125,000 climbing routes.” To read more, click here. --Utah saw the lowest amount of snow they’ve ever recorded at 267.5″ of snowfall at Alta in 2014/15. They’re previous lowest snowfall amount of record. 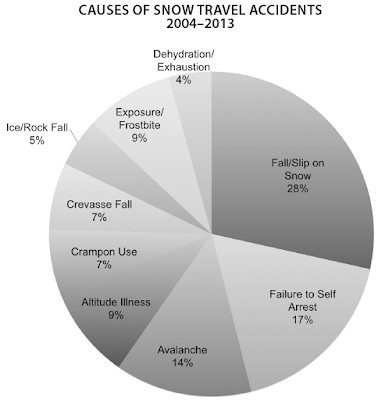 In 2015, Utah experienced 116 human triggered avalanches with 26 humans caught in avalanches, 3 injuries, and 1 fatality. To read more, click here. -Alta is currently defending itself at a federal appeals court on Friday from a lawsuit saying that their exclusion of snowboarders is unconstitutional. “Quite simply, the Constitution neither recognizes nor protects a right to snowboard,” Alta attorneys wrote in court documents. The fact that anyone would believe that the right to snowboard is in the Constitution is funny all by itself... To read more, click here. 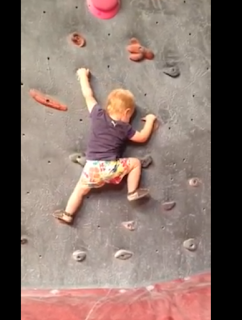 --The "Climbing Toddler" is sure making his mark. As of this writing, the little guy had over 17 million views on Facebook. If you haven't seen it yet, click here. --Professional climber Will Gadd, wrote an entertaining rant on Instagram last week. Essentially he called out people who post photos on social media which imply success on climbs. He argues that implied success is not success and that people are "posing." To read the post. click here. --There is a couple currently trying to climb the state high points in the Lower 48 in record time. To do this, they need to do them all in less than 23 days. To read more, click here. --Thanks toe the Access Fund and the Upper Peninsula Climbers Coalition, the AAA walls in Marquette, Michigan have been reopened to climbing after being closed for a year. To read more, click here. --And finally, the Girl Scouts went camping and "climbing" on the White House lawn, which is kinda' cool.